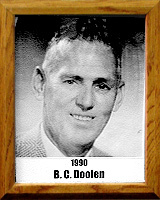 Before his death in 1955, Doolen was the nation’s top-ranked basketball coach, compiling a 158-26 record in Nebraska; 148-23 at Miami, Arizona; and 395-86 at Tucson High School. He’s held the best win-loss record in the nation. No American high school dominated sports as it did under the coaching of Doolen, who was a fellow athlete of the legendary Harold (Red) Grange while attending the University of Illinois, where he was a four-sport star. When Doolen became head basketball coach at Tucson High School in 1935, his Badgers won 5-state championships, and two teams went undefeated. In one span, his teams won 51 consecutive games. His overall career coaching record was 713 wins, 134 losses for a remarkable .814 percentage. His teams were known not only for good sportsmanship, but contended for state honors every year. Doolen Junior High was named in his honor.